Hanoi has hundreds of restaurants – here are my personal favourites. There are definitely many more places I haven’t eaten at in Hanoi that are no doubt equally as good. If you like trying food, Hanoi is a gastronaut’s delight. Not only in Vietnamese cuisine arguably even more delicious than Thai food, Hanoi still has a heavy French influence in its cooking that means you can get a Parisian dinner at South East Asian prices. Not only that, many cooks have begun fusing French and Vietnamese cuisine, creating some unique dishes. 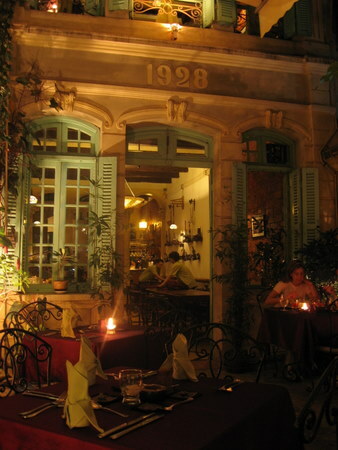 Add the colonial charm of several of Hanoi’s restaurant locations and you have the perfect recipe for memorable dining. 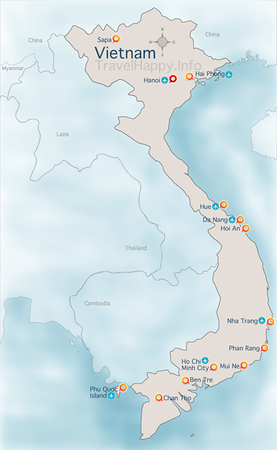 None of these places are difficult to find – they’re all listed in Lonely Planet Vietnam. Follow the link if you want more info about what to see and do in Hanoi – just don’t go to Cafe Dung. A cracking Indian restaurant with a great little balcony overlooking the street if you’re lucky enough to get it, Tandoor has a wide mix of Indian cuisine. Forget the stodgy fare that often passes for Indian food in the UK – Tandoor has lots of dishes that are light on the stomach and taste delicious. Portions come in a tapas style, so you can choose several to sample lots of different dishes. My favourite restaurant in Hanoi, set in a palatial old building with its own courtyard, complete with spiral staircase, and serves excellent 2 course set lunch menus for an unbeatable $US 6. Staff service is impeccable and there’s just something about the outside ambience I love – not too formal, but very elegant and certainly superb food. Slightly gimmicky with the restaurant seats remade from Hanoi’s omnipresent cyclos, Cyclo has an excellent range of French and Vietnamese cuisine. I’ve eaten there several times over the last four years and never been disappointed. A spectacular colonial house restored to its full glory, Seasons provides a fantastic excuse to make dining out a real event without breaking the bank. This is quite posh, formal dining, but the prices are extremely cheap – dress up in your new Hanoi threads and enjoy. It’s a little bit of a journey outside the Old Quarter but worth it. “Hanoi’s Finest Coffee” proclaims Au Lac’s logo, and they’re not wrong. Opposite the posh Sofitel Metropole hotel, Au Lac is a cosy outdoor courtyard where you can get your caffiene fix and also enjoy some excellent food – besides the coffee, I’m particularly fond of the crab spring rolls. Recently reopened and expanded, Koto is opposite the Temple Of Literature and offers great Vietamese and international dishes. Best of all, the proceeds go to helping train up Hanoi’s street kids as restauranteers, who make up all the staff in Koto. Rarely has having dessert become such a philanthropic necessity.